Through My Eyes: First Backpack Trip. It has always been in our checklist to backpack travel across few countries. Of course our ultimate place to go backpack is Europe but for now, we will just start with the neighboring countries, since budget and time is a factor. A BIG FACTOR. Usually, the planning-post will come together with the travel-post itself but I supposed that travel-post is going to be a long one since we will be gone for so many days. I cannot even imagine the number of photos that we're going to take. Heh. We started talking about this backpack trip a year ago but never really set a date on doing so. We finally agreed on a date and decided to really make this happen. 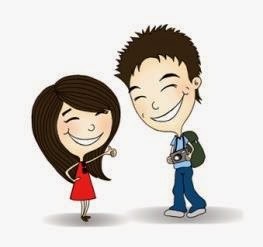 Today, I created a Whatsapp group called 'Backpack (1-10 May 2015)'. The route that we were going for was also decided, sort of. Eveything from then on went quiet for a while because we were still waiting for confirmation from Jack and Carmen. In the end, we had to postpone the trip because Carmen has her internship during the mid year season. Carmen confirmed that our new date which is 16-25 September is good for her. No college and no more internship! Jack however, still unable to give a 100% yes so we're just keeping our fingers crossed! Initially, it was BANGKOK-SIEM REAP-PHNOM PENH-HO CHI MINH-PENANG. 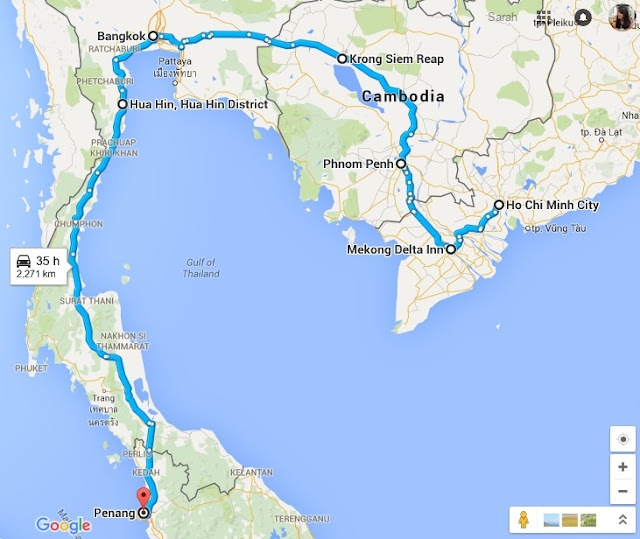 We decided to change the route because it's more pricey to fly back from Ho Chi Minh to Penang. So, now our new route is HO CHI MINH-PHNOM PENH-SIEM REAP-BANGKOK-PENANG, since flying to Ho Chi Minh is a lot cheaper. We met up for supper to discussed on the final planning. This meet-up was important because if we were to go ahead with this trip, then we have to quickly get the flight tickets to Ho Chi Minh from Penang, which will be our first stop and from there, we will travel by foot backpack style all the way to Penang. Everything looks great but Jack still need more time to confirm if he could take 6 days leave from work. For the rest of us, we're a-okay with leave application. Since Malaysia Airlines is having special promotion for the KL Matta Fair 2015, one way ticket from PENANG-HO CHI MINH costs only RM284, which is what we would like to get instead of their normal price at about RM400 for one way. Roughly about there. Received a "YES!" from the other three humans to proceed with the Malaysia Airlines' one way ticket to Ho Chi Minh. So happy I was ready with the deets to purchase them! Then, turns out we needed the passport details too which I totally forgotten even thought I just got the flight tickets to Hanoi, like 5 months ago! Heh. So, it shall wait another day then. Price please don't increase okay? It was a spontaneous-declared Public Holiday by the CM in conjunction of an election happening at Permatang Pauh so we went out to Queensbay with the grandmother. While walking past Country Hide store, mom noticed that there were sales going on, right up to 70% and then I saw a few selections of backpacks under that category. We went in and immediately got the details and walked out. I texted Carmen to ask if it's going to be a good brand to invest on and if the price is okay. She asked her mom and gave me the green light. Her mom actually thinks that it's super cheap for a 55 litres backpack, so I got mine at RM158.40. Koay will be heading towards Country Hide store tonight to get his. Better for him to see which color and size he wants. One of the most important thing we need for our backpack trip is finally off the list. Feels good. Such a win lah really. LOVE IT! We had a quick dinner and decided to build our temporary fort at Nois Cafe at Sungai Dua. One Iced Caramel Latte and one glass of hot Rose tea, accompanied with two laptops and the night has begun. Lots of Googling and wow moments as we both searched for places to stay and things to do on our upcoming backpacking trip. Since there are 6 of us and there are 3 countries, it was decided that each couple takes up 1. Oh ya! Forgot to mention that Andrew and Beverly will be joining us on the trip too! SO HAPPY OKAY. We were at the cafe for a good 3 hours and finally when Jack and Carmen came, we looked into getting a place to stay at Ho Chi Minh which will be our first stop. We got a very cheap deal at Expedia! Deluxe Twin Room - RM240 (for two nights and 4 adults). So that's RM60 per person for 2 nights. I'd say this is super cheap considering the location being right where Ben Thanh Market is. Another win! One month to go and we decided to meet when everyone can. We are going on Malaysia Day but Andrew/Beverly will only come on the third day. We sat down, ordered our drinks/food and went through country by country. Googling the entire time for information on bus options and places to stay et cetera. Overall, everything seemed really cheap. Ohh and then we saw that USD is now 4.0 to RM1. MADNESS SIAL. While waiting for Koay to get back to his hotel in Sabah, I just thought maybe I will come in here and update something related to this trip. 10 more days. I cannot believe that it's less than 2 weeks to go before we do this. It seemed like it was just few days ago that we still struggle to find people to go with! Now, there's 6 of us. Oh myyy. I know it's going to be amazing, and tiring and hopefully homesickness doesn't hit me. I know right, I'm such a big baby. Bleh. I actually just got my annual leave officially approved yesterday. Talk about living a risky life huh. Worse case is I don't get to go and have to burn the RM284 PEN-SGN ticket nia ma and probably sulk and emo at home for the whole 10 days when they gang is there. Heh. You know till now, I'm still not quite sure if we have to check-in our backpack or we can carry it up to the plane as hand carry. By right, must check-in because very big leh. But then again I've seen backpackers bring their equally-big=backpack-as-ours up to the cabin eh. So, this part I'm still unsure. Then, if I check-in, how to secure the backpack wor? Cannot be putting mini locks on every zip right? Go plastic-wrap ah? Or just risk it and not do anything since when people see backpack, people will usually think its just clothes inside which is true. Hah. Aiya, I'll just be flexible and see how it goes. Ahh, sleepy already. Going to bed now. A week to go guys. We met up again to finalize on money exchange stuff. Just in matter of days, the rates went up so much. Thai Baht used to be equal to our money okay. Blehh. Anyways, we didn't do a lot of research or whatsoever today because all too excited already. That and we have 3 travelling members currently down on fever, flu, cough and headache. We're praying that their germs don't spread to the rest of us, not just a week before the trip. I am definitely staying away from Koay for a while. Cannot afford to fall sick now. Need to be in the best of health this week onwards. 90% decided on the route! Yay! Can you tell that we are very excited already? I am 70% super excited for this loooong getaway. No need to check emails and see clients. The sad thing is today I have another conference call/training before I can pack my laptop and not see it for the next 2 weeks. Hah but I'm not complaining okay. So difficult to focus on work today. I haven't start packing my backpack yet. Honestly, I don't know how to start. Usually when I go for a holiday, I will basically bring anything that I see in my closet because I can never plan ahead on what to wear. So, just bring anything and decide later right. The thing is now I have to carry the backpack, no roller wheels and boyfriend obviously not gonna carry my backpack, so tonight is gonna be a long night of packing. OR I CAN ALWAYS BUY NEW CLOTHES THERE! Heh. Okaylah, I better get going now.